Scripture Song CDs by Wayne Hooper -With these three CD's you will have enough music for 3 years of memory versesone for every week of the year. Listen to some Samples. Give your children every advantage in memorizing Scripture. Teach them Bible verses set to song! 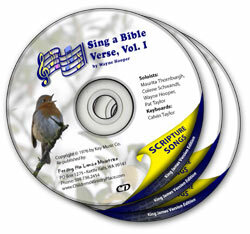 Each CD contains 52 word-for-word Scripture songs which include the Bible reference. With the reference in the song,the children will not only remember the words of the Bible (*KJV - King James Version) but also where to find that verse. With these three CD's you will have enough music for 3 years of memory versesone for every week of the year. These songs correspond with our free childrens Bible studies. You may also like to download our free powerpoint pictures with words that correspond to these songs. These songs correspond with our free childrens Bible studies. *Please note that a few of the songs are from another Bible version,but the vast majority of them are from the King James Version of the Bible.